Subal have announced their latest housing for the Nikon D100 digital SLR camera. Deliveries should be available by the end of the year and there will be controls for shutter release, front control dial, on/off, exposure compensation, flash sync, display light, mode dial, M/S/C, manual focus, zoom, lens release, AF lock, meter switch, focus area selector, delete,flash power compensation, menu and enter/OK. 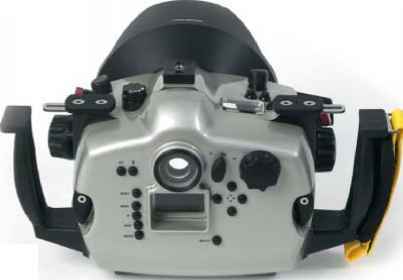 The housing will be similar to the Nikon F80 and will have an optical viewfinder as well as the LCD monitor port. 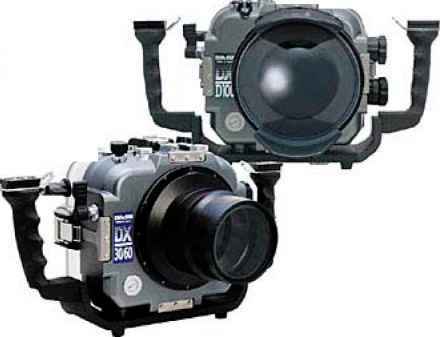 The camera is mounted on a sprungloaded baseplate and the housing is secured with Subal's QuickLoc levers. The D10 will have the standard Subal bayonet port system, two flash sync sockets and a top mounted accessory shoe. The Subal wide angle port for the CP5 Nikon Coolpix 5000 housing is now available and it incorporates a unique sensor for use with TTL flash. The port can be used with either of the two wide angle lenses WC-E68 and FC-E8 and the dome is made from optical glass. This port completes the CP5 system making it the most versatile midrange digital stills camera outfit on the market today. Kodak has announced the new 14 megapixel DCS-14n. The magnesium-alloy body is built around a Nikon F100/ F80, has a built-in portrait grip and is notably smaller than any previous Kodak DCS D-SLR. The camera is powered by a Lithium-Ion battery, takes Compact Flash (Type I/II) and SD/MMC storage, supports JPEG-ERI (higher dynamic range JPEG) and also features an orientation sensor. The camera should be available in December with an expected street price of US$4,000. The DCS Pro 14n is Kodak's sixth-generation professional digital camera and is primarily designed for professional and commercial photographers, but will likely be popular with advanced amateurs as well. Built on a Nikon lens mount, it adds speed, as well as quality, to the photographers' workflow through FireWire connectivity at a 12 MB per second transfer rate. "This is the camera that portrait, wedding and event photographers have been waiting for," said Jay Kelbley, DCS Product Manager, Kodak Professional. "In addition to its highly competitive price point and phenomenal 13.89 million total pixels, the DCS Pro 14n is loaded with features and, thanks to Kodak Professional firmware, its overall image path enhancements make it the most upgradeable camera on the market." 36mm image area of 35mm film, allowing photographers to regain the benefits of true wide-angle lenses and use their Nikon SLR lenses as they have used them with 35mm film. With the DCS Pro 14n photographers have the freedom to select the image size (full 14MP, 6MP, and 3MP) that suits the shooting environment. The camera captures images at about two frames per second. Images can be saved as DCR raw files or Kodak Professional Extended Range Imaging (ERI) JPEG files. Kodak ERI-JPEG files serve as another form of picture protection for photographers, especially in situations where re-shooting is inconvenient. Kodak ERI-JPEGs are created by and stored incamera on removable media for later color correction or manipulation, and provide two-stops of exposure latitude and extended color space within a JPEG workflow, a benefit no other competitor offers. The ERI-JPEG format provides professional photographers ease-of-use of JPEG files with the image quality and color/exposure control of Kodak's highly regarded DCR format raw camera files, to create the best quality images. The Kodak Professional DCS Pro 14n Digital Camera is leveraged from a Nikon lens mount and the magnesium body is more durable and robust than plastic digital cameras based on similar camera platforms. The DCS Pro 14n uses cast magnesium encasements for a solid, rugged camera body instead of the plastic encasements commonly used by other manufacturers. The robust body includes a vertical trigger that works in conjunction with the camera's auto orientation sensor. The sensor detects the camera's orientation +/- 90 degrees from the horizontal position. This enables automatic rotation of the image as it moves to a computer for manipulation, saving photographers time and improving workflow, hallmarks of Kodak Professional's efforts to make digital easier for customers. These details were announced at Photokina 2002. 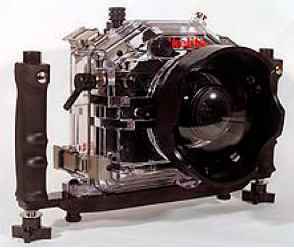 Rich with features found only on higher-end systems, the F707 housing from Gates is designed for both the professional and recreational underwater photographer. Professional-level controls, a dedicated external strobe, and the Gates Multi Port lens system make the F707 from Gates a highly flexible, yet user friendly digital still housing. Control Access - The professional will appreciate access to all key camera functions including manual focus, white balance, auto exposure lock, and complete exposure control in shutter priority, aperture priority and manual modes. 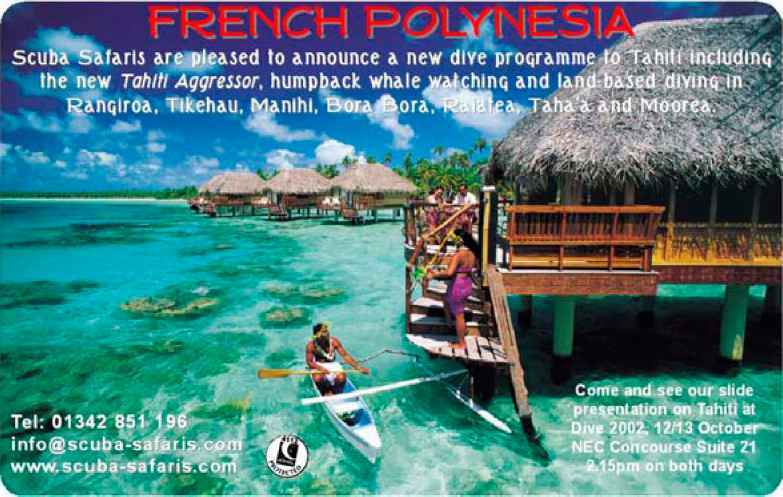 Of course, full auto operation is available for the recreational diver seeking superb digital images. Dedicated Strobe - Forget about manually dialing in strobe settings, fiber optic slave connections, or other mismatched components! The Gates F707 uses a dedicated external strobe linked directly to the camera. When not in use, the F707 strobe enters a sleep mode to conserve battery life. 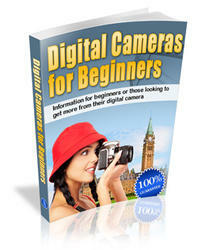 For Videographers - Already have a video system? 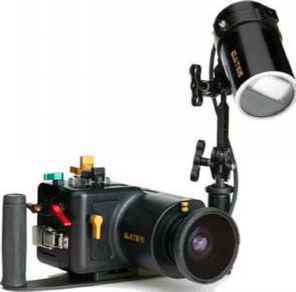 Underwater videographers will find the F707 an easy transition to digital stills. Controls like zoom, white balance, exposure control, and auto/manual focus will be familiar territory. And Gates video lighting is 100% transportable to the F707 for night and close-up photography. 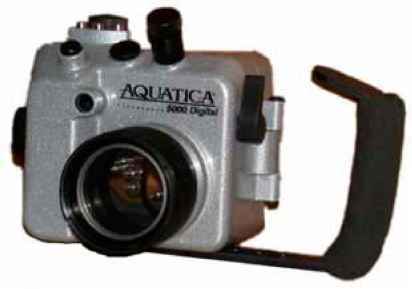 The Aquatica A5000 is a very compact housing that allows easy access to all of the key camera controls. Users are able to view their pictures instantly through the lcd screen and the shade dramatically improves viewing under difficult conditions. The A5000 housing has a foam grip handle for easy portability. It comes equipped with one Nikonos-style bulkhead, with the option of using a second. The housing is fully anodized in black and coated with a polyurethane powder paint and a clear coat. Sea & Sea have announced the imminent arrival of their housings for the Nikon D100 and Canon D60/D30. The Fuji S2 Pro is based on a Nikon F80 / N80 camera body, utilizes Nikkor lenses, and provides TTL capability with all of our TTL SubStrobes for a complete system of proven components. The following controls are provided: Shutter button, Power switch, Exposure +/- button Flash +/- button, Lens release button Main command dial, Sub-command dial Exposure mode dial, Play button Auto exposure bracketing button, Synchro mode button, Zoom. The Ikelite SLR-MD Case allows visual assurance the system is safe with a clear view of the camera information and control functions. Ikelite housings are injection molded of clear polycarbonate for its superior strength and corrosion-free properties, and operate safely to 60m (200 feet) depth. strobes, mounting systems, and accessories. 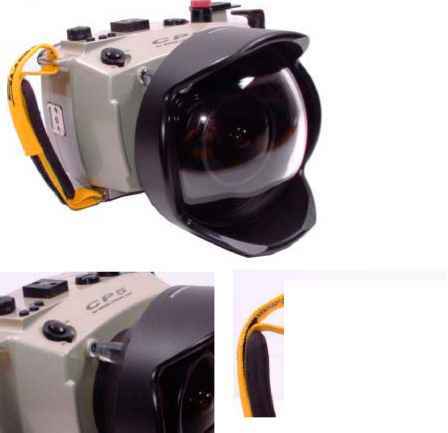 The Ikelite Super-Eye magnifier provided with the housing secures to the camera eyepiece and offers enhanced viewing while wearing a diving mask. 10.5" wide x 8" high. Front-to-back measures 6" plus port. Width is 14" with the removable handle bar attached. The housing with handle assembly and port weighs about 10 pounds. 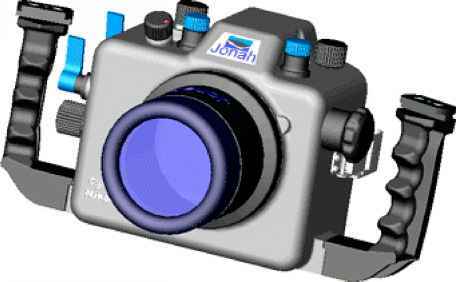 A new South Korean company has begun producing housings for Nikon F100 cameras and plans housings for Canon EOS3 and Leica R6 cameras. In addition they are working on a housing for the Nikon D100 (right) digital stills camera which should be available towards the end of the year.